We love all of our fans, and we’ve just reached 56,000 likes on our BERNINA USA Facebook fan page. That means it’s time for another giveaway! We quickly gained another 1,000 fans to hit 56,000 likes on our Facebook fan page! As a way to say “Thank You!” to all who join us at Facebook to share your love of sewing and creating with us, we are holding another special giveaway. If you are already a fan of BERNINA USA on Facebook, then you know that we’ve pledged to host a giveaway with a chance to win fun prizes like goody-bags, sewing books and even fabrics right here each and every time we gain another 1,000 likes through the end of 2013! Join in the fun by clicking over to our fan page, Like us, and be sure to keep your eyes open for our next giveaway. When you were first learning to sew, was there one piece of helpful or inspiring advice passed on to you? What was it, and have you passed that advice on to anyone else learning to sew? Sweepstakes Rules: Open to residents of the 50 United States and the District of Columbia. One comment per fan. Comment must be submitted to the WeAllSew.com blog within 24 hours after blog post posting by August 18, 12:00 midnight Central Time. Winner will be chosen randomly. Winner announcement: the winner will be announced here at this blog post early next week, and will have 48 hours to contact us to claim the prize. Keep checking back here starting next week! WeAllSew fan tknight888! Congrats to you! Please contact us at WeAllSew@berninausa.com to claim your prize within the next 48 hours. Once we authenticate your email, we’ll pop your new book in the mail to you! My mom taught me to sew when I was 4. She always said the needle would hurt if it hit my finger and she was right! I tell my young grandchildren this every time they use my sewing machine. The best piece of advice I got was that if you make a mistake (and as long as it is one that doesn’t wreck the pattern) it is a “Design Feature”. Sometimes now, I make deliberate Design Features so that my item is unique and special. I was taught to always baste difficult seams. I hated it. I was told that in the long run, it would take less time to do it right the first time. I hated that too. It was good advice. I hate that!! My Mom taught me to sew when I was a child on a treadle machine. The most helpful thing she taught me was to take my time and (hopefully) do it right the first time. When I was a teenager I would sew a lot of my own clothes (I was taught by my Mom) but my one failure was to put a hook, snap or button on the waistband…never did. (“a safety pin works” was my answer) My mom always said that it was important to finish and finish well and not do shoddy work. Since becoming an adult I always try to finish what I start and I always encourage my students to do the same and to do their best work….a hook, snap or button is the final step and I don’t ever forget it. My mom taught me I don’t have to use carbon paper & tracing wheel to mark darts or matching dots, instead, just use pins. Much quicker & no cleanup of marks. I have shared this with my daughters & neices who are now mothers, as well as many friends. Thank you mom. I love & appreciate you. My mom taught me to sew at a young age. I made my ‘first day of school dress’ for fourth grade, and I even got to pick the fabric. She believes you should love the fabric, and pattern. Take your time, and don’t sew when you are too tired – it will be there tomorrow. Measure twice, cut once, just like with carpentry! The best advice I got was that “it doesn’t have to be perfect”, meaning not every seam or corner will be perfect and not to stress out over it. It was to press ( not iron) after each and every step. It makes for a much better finished project. Simple, but necessary! Grandma told me to always be sure to keep my sewing machine oiled. I learned to sew from my Mom. My first project was for my Girl Scout sewing badge. I made a dress with a coordinating vest and skirt. My Mom said to measure, cut and sew accurately so that it fits correctly. I use that same bit of wisdom in quilting now and pass that on to those in the quilt group I lead and teach at. When I was learning to sew, as a child, my mother always told me to make sure my seam allowances were the correct size and she made me practice sewing a straight line by making pillow cases. That piece of advice has stuck with me all these years and it has paid off in so many ways. I have been a professional seamstress in years gone by and now I just quilt and sometime sew for my grandchildren and great grandchildren. I LOVE TO SEW…. It sounds sort of minor, but in home ec in 7th grade, I learned toknot thread by rolling it around and off my finger then pulling it tight. Been using it every since. When working from a pattern, always read the entire instructions before beginning, otherwise you may make an assumption that turns out to be disastrously wrong! The best advice I ever received was to press after sewing. Taking just a few seconds to do this makes all the difference in the world! My mom always encouraged me to sew whatever I wanted and always loved everything I made. I believe that kind of encouragement made me want to do my best so she would be proud of me. To make the inside just as neat as the outside. I was given the advice to stop, breathe, and smile. After having to re-sew my first zipper over 3 times, rip out my hand-sewn blind-hem stitches and re-do them….this became important advice. It caused me to relax and feel confident that I could do what was needed if I just relaxed and tried again (and not being scared to rip). I’ve taught over 50 people to sew, and over 10 of those are kids learning for the first time. The ones that take to heart the “stop, breathe, and smile” mantra that I repeat tend to have the most fun! Sewing is a pleasure, and I love to pass it along! Have fun and enjoy what you are doing. Life isn’t perfect and you will make mistakes. Have fun and enjoy what you are doing! My grandmother always told me press my seems as I go. I passed this on to both daughters and granddaughter so far. My dear friend Jean, told me, “You could do this. Just think it through”. I have used that advice MAMY times and passed it on to my new sewing friends! To load the bobbin into the case the thread must pull away from the thread slot and be pulled backwards into the slot, always! This keeps. It from unraveling too fast & making a mess…. My mom taught me to slow down and enjoy the sewing as I went along. Fortunately I listened to her and not my home ec teacher who had little patience! I have passed this along to my friend that I am teaching to sew as well as just in general to my own children and students at school. When I got my new Bernina almost 8 years ago, I learned that patience is an important virtue and to enjoy the experience of all the color and creativity. I value all the tips and lessons from my friends at the Bernina store. No I can pass it ion to my friends at the quilting club. Practice, you can only get better. Use high-quality thread, and match the thread in your bobbin to the thread in your needle. You will have fewer problems and your sewing will be much smoother and trouble-free! When I was a very little girl my mom told me to iron down the seam folds, so they are easier to sew. My mom taught me most of what I know, in terms of sewing. I hope to do the same for my baby girl in a few years. My Mother taught me to sew and I also took Home Economics in school. I was always taught to press each seam after it was sewn so it would stay flat. I have always shared this with others who sew. Your sewing will always look more professional when you do this. Just like advice for a carpenter ~ measure twice; cut once. In high school, for home studies i learned the basics of how to sew then learned the rest on my own. The most important thing for me that I have learned is, if I am not in the right mood to sew, then don’t, because anything that can go wrong…will! I taught my daughter to sew and I always remind her of that. My mom taught me to sew when I was about 5, when I started sewing dolly clothes. I was always in a rush to do everything, to get it done….she was always reminding me to “take your time” . I didn’t start to quilt regularly until after she passed. She would be so proud of the time and care I take with my quilts. My grandmother did all her sewing by hand and i watched her. She never had a machine, but my parents bought one for me that I learned by trial and error and reading books. Over the years the best advice I’ve gotten is to take care of your machine and it will save you time and money. I’ve had my Bernina 1090 for 20 years and I love it, it has never let me down. Be patient , you will make mistakes but with each mistake you learn . Combining hand basting and ironing before and after machine sewing gave me the most professional looking seams. I pass this on to all my students. Your hand needle and your iron are two of your most important sewing tools, along with the best quality sewing machine you can afford, which is a Bernina in my opinion. The importance of pressing to give a home sewn outfit a professionally-made look was stressed to me early on. I learned to sew in 8th grade home ec class and have been sewing every since. Thank you for the chance to win that wonderful book. 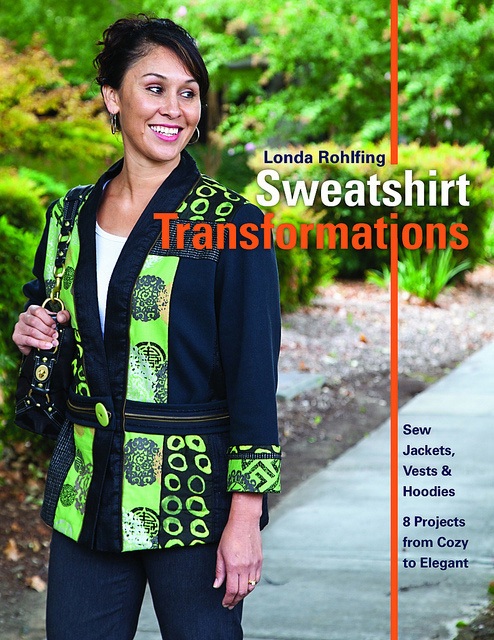 I love the look of the remade sweatshirt on the cover! A seam ripper will be your best friend, if you use it properly. Yes, but they would have soon learned that wisdom pretty quick themselves. Although my mother bought me everything I needed to sew, my High School teacher taught me. First she saw to it that we totally respected grain lines. Then a favorite technique she taught replaces backtacking, which sometimes can leave a lump. We learned to end a seam with an invisible knot. We learned to lift the presser foot a TINY amount, just enough that the feed dogs did not catch the fabric, and sew 3 or 4 stitches. They all went in the same hole! This makes a lovely knot. And I guarantee, you do not want to have to use the seam ripper on that knot! I learned how to sew from my Girl Scout leader. She taught me that there was no shame or embarrassment in ripping out a mistake. Even though it may be discouraging or frustrating, we shouldn’t settle for mediocre work and should always try to do our best. As a Home and Career Skills teacher for 30+ years, when my students would goof up in making their sewing projects I would try to pass along the same message. I did acknowledge their frustration and/or disappointment in having to rip out a mistake by giving everyone a coupon for “one free rip” that I would do for each student. I still remember my high school sewing teacher’s name, Mrs. Lipman. She taught me to take my time and do it right, even if that meant ripping out and starting again. She instilled in me a sense of pride in my work. I always approach my sewing with the eyes of someone else looking at my work. I want my projects to represent me and the importance I place on each project. My Grandmother and Mom both taught me to sew. Both of them taught me to start stitches with a few forward and then reverse stitches. First outfit I made was from flour bags that my Grandmother saved for me. I still have her sock darning tool! The advice was from my mom and she told me to take my time and always press carefully through each step of sewing. When sewing with napped fabric, make sure the pieces are all running in the same direction–one of my friends made a pair of corduroy pants, and ran one leg piece the wrong way. She wore them anyways, but the constant reminder ensured she didn’t make the mistake again! My aunt Monia always said Patience and take a deep breath. The rules are meant to be broken. Liberating! When I was first learning to sew, I would proudly show all my finished projects to my Grandmother. The first thing she would do is turn a garment inside-out and look at my seams. She always told me if it looked as good on the inside as it did on the outside, it would last until I outgrew or wore out the garment. I learned to sew when I was younger from a woman in our neighborhood who started a monthly, girls club called Busy Bees. She taught us many things but I think she mostly taught me to enjoy the process and have patience. I try to remember that as I pass it on to my daughter. My Aunts bought me my first sewing machine when I was 6 years old and I have been sewing ever since (over 50 years). They would always say, “your garment seams should be so well finished that you can almost wear your clothes inside out.” That would include ironing the seams as you sew. This really makes a difference. Best advice I ever got was: “Pin, pin, pin, and then pin some more!” I tell my quilting friends this all the time! Practice, practice, practice! When working on new projects, new designs, and/or new techniques, always practice with a sample piece. Use the same material and tooling that will be used on the main project. I learned to sew in home ec class and a piece of advice I remember is to pay attention to seam allowances and be consistent with them. I can’t honestly say that that I’ve passed the advice on because I don’t know anyone else who sews. That’s why I appreciate the online community of sewers! Clip your threads. Leaves a much cleaner look. I have passed this on to many. Read through the whole pattern before cutting the fabric. Don’t be afraid! You will make mistakes but think of them as training examples , the next one will be better! My Mother taught me to use her sewing machine. I now own a Bernina 730E . I love it. The most important thing I learned when sewing was to press each seam after it was sewn to give it a more professional appearance. The other thing mom said was to clip the curved seams according to the directions so they would be flat. Tear fabrics to get the straight of grain, then everything will hang much nicer. When sewing quilt squares, press. Don’t iron. Press, press, press! This can make your project come out wonderfully!